It accesses a part of my brain that I never knew existed, so that during the day I have memories of images that are so vivid and which have such strong feelings attached to them that I am able to use them to achieve what I want. Although Hans-Peter is not a native English speaker, I am very comfortable to speak to him and have his feedback, as his English is so good. I enjoyed the very solution focused coaching sessions by phone very much. The symbolic modeling has enabled me to discover depths to myself that I never knew I had, and thereby achievements that I wasn’t dreaming of before. Hans-Peter has a restrained and gentle approach, which respects the client-facilitator relationship. How to feel open and friendly and absorb what people are saying to me. How to be calm in an exam and how to prepare for the exam. How to go about changing my career. How to have a winning feeling even when the facts state that I am not winning. How to be solid and sure of myself. How to speak a foreign language with the confidence that I have when I am practising. How to have the discipline to keep to a particular routine no matter what happens . How to listen better to other people. I would highly recommend Hans-Peter as a clean language facilitator. 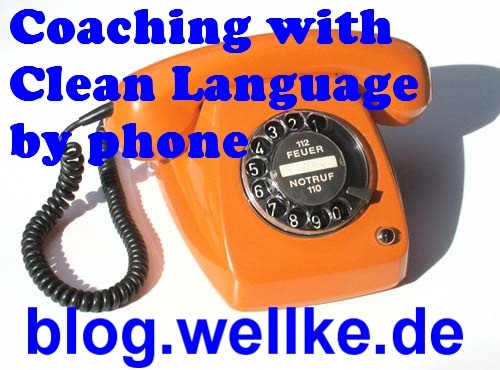 Dieser Eintrag wurde veröffentlicht in Alle aktuellen Einträge, Coaching, Coaching, Referenzen, Telefonisches Coaching und verschlagwortet mit Clean Language, Coaching, Coaching by phone, Telefonisches Coaching von Hans-Peter Wellke. Permanenter Link zum Eintrag.